The Holocaust was not about 4 million or 5 million people dead. It was the fact that such large millions were brutally exterminated, just because they did not satisfy weird ideas of cultural supremacy. The Holocaust was not about gas chambers or concentration camps. It was about whole families torn apart for no fault of their own. Fathers from daughters, mothers from sons, brothers from sisters, entire families just shattered. Babies wrenched from their mothers arms, old men considered unfit and thrown from balconies, young women and men worked to death in sub human conditions. An entire generation destroyed to satisfy the whims of a megalomaniac. The Holocaust was not about Jews or Gypsies or Poles or Communists. It was the fact, that human beings were reduced to a state, where they had to live like animals, fighting for survival. The Holocaust is the single biggest disgrace in human history. And no amount of denials or fabricated evidence can erase this biggest stain on our conscience. And one of the best novels to deal with this is Anne Frank: The Diary of a Young girl published in 1952 ( the Dutch version came in 1947 ). 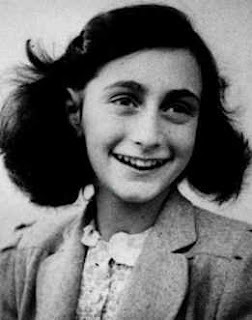 Anne Frank was like any normal girl, she loved playing around, had friends, dreamed of a Prince Charming . Just like any normal girl of those times, but she was a Jew , and that was a big crime in Nazi Germany . Her father Otto Frank , had long ago migrated from Germany , to the more safer climate of Holland in 1934 , when anti Semitic demonstrations broke out there. He started his own business in Amsterdam , and the family led a comparatively happy and peaceful life there. Anne and her sister Margot , were good students at school also. Till the Nazi army, attacked Holland in 1940. Holland was one of the few places in Europe , which had a more liberal climate, and that was anathema to Hitler . The ill equipped Dutch army was no match for the professional Nazi army, and soon the country came under the Nazi jackboots. And like in most other countries under Nazi rule, they started to come out with blatantly discriminatory rules. The mandatory wearing of the yellow badge , segregating the Jews into ghettoes, decreeing that they could attend only Jewish schools. The first part of the diary covers the period between June,1942 and December, 1942 . Most of the early entries center around her life, her family, her school, her dates, much like a typical school girl of 13 years. But she also lists some of the more restrictive rules that the Nazis placed on them. For eg the compulsory wearing of the yellow star and her relocating to a Jewish school. During July, 1942, her elder sister Margot was ordered by the Zentralstelle für jüdische Auswanderung, basically a Nazi front organization in Amsterdam , which dealt with forcible deportation of the Jews . This is what makes the family go into hiding from the Nazis. They hid an annexe in their office building, in fact walking all the way, as Jews were forbidden to use public transport. And they hid there for most of the time, till they were captured. This is the most critical part of the diary. Basically it covers 2 periods Dec,1943 to April,1944 and from April 17,1944 to August 1,1944 when she and her family were betrayed and arrested by the Gestapo . Most of the diary is addressed to her fictional friend, Kitty, and begins with the line “My Dear Kitty”. This is where she describes about how it is to live under constant fear, her feelings, her beliefs, her ambitions, and those topics she felt could not be discussed with any one. She also writes of God, and human nature. And her relationship with her boyfriend Peter. As a book, Anne Frank’s Diary , hits you in full force. How would you feel living under a constant fear, that one fine day, your entire life could be gone? Today we lead a comfortable life, and often get irritated over minor things. But what of this young girl, who finds her dream breaking away? Who dies every day to live another day? Anne Frank’s diary is at once depressing and yet uplifting. You feel depressed by the fact, that such a lovely young girl, finds her life being shattered. Yet at the same time you are inspired by her courage to face life as it comes. She does not go into self pity, she faces death with a tremendous sense of equanimity. The horrors of facism when seen through the eyes of a young girl, hit you brutally in the face. You keep asking yourself why. What crime did this girl commit, that her life was cut short so brutally. What crime was commited by so many families like hers, that they had to live with the trauma for their entire life? What made humans so inhuman to another human, that they would willingly destroy entire families? Why was such a megalomaniac man, allowed to get away with his crimes? Yes the Allies won the war, and Hitler himself commited suicide, but at the cost of millions of lives. Millions of innocent lives snuffed out, families destroyed, cities reduced to rubble.There is a scene from the movie, The Pianist . An old Jewish woman, is carrying some meager food. A hungry Jewish man, assaults her, and as the food falls down, he frantically, laps it up, trying to stuff as much. The old woman sobs as her meager rations are also lost. That is what the Holocaust did, reducing human beings to animals fighting for survival. And tragically we have not learnt any lesson from this. Rwanda, Bosnia, Cambodia, Kashmir the names change but the story remains the same. Of a brute majority, supressing the minority, just because they happen to be of a different stock. We don’t understand the fact that bigotry and racial hatred, ultimately destroy us. The whole of Germany had to face a heavy price, for Hitler’s Aryan supremacy. In that sense Anne Frank’s Diary is a novel, that needs to be read, by every human being, to understand the futility of fascism. This entry was posted in Holocaust, World History, World Literature, World War II. Bookmark the permalink.